Hello. This is a web site, and this is me writing on it. I'm a writer, so that's what I do, when I'm not finding creative new ways to avoid being creative. I'll write more on it when I have more writing to write about. My name is Ian (F) Martin, I live in Tokyo and write primarily about the local music scene, through my blog Clear And Refreshing and various magazines and websites. 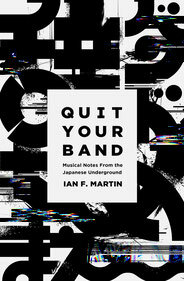 My book Quit Your Band! Musical Notes from the Japanese Underground came out in 2016 from Awai Books, with the Japanese edition バンドやめようぜ！ following in 2017 from Ele-king/P-Vine. I sometimes write about other things, if they interest me. I also run an indie/postpunk label called Call And Response Records and organise small live events and parties around Tokyo and elsewhere in Japan.